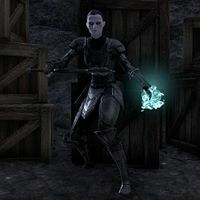 Leidmir Corpse-Caller is a Nord vampire leading the House Montclair soldiers found inside Hildune's Secret Refuge. She has a chance to drop Corpse-Caller's Fury of Necropotence, a unique item in the Necropotence item set. Leidmir is accompanied by Beline and Nadafa. Killing her will clear the dungeon.